TCA chemical peels such as the Obagi Blue Peel treatment are those that are considered to bring more desirable results compared to an AHA chemical peel. Considered to be a medium-depth chemical peel because it goes deeper than just the outer most layer of the skin, a TCA Obagi Blue Peel effectively does skin resurfacing to uncover a new layer of skin that appears more youthful, and move vibrant. The degree and depth of penetration of the Obagi Blue Peel treatment can be adjusted by a Woodbury Dental and Laser Clinic specialist in Kent, to successfully address the concerns of the patient. The Obagi Blue Peel uses Trichloroacetic Acid (TCA) as the active ingredient, which will be mixed with the patented Blue Base from Obagi. The Kent skin care professional will apply the Obagi Blue Peel based on the patient’s level of skin damage, and based on the patient’s desired level of transformation. The Obagi Blue Peel procedure takes less than an hour and does not usually require sedation or any form or anaesthetic. The cosmetic skin care professional or physician will apply the Blue Peel typically to the face and neck areas, to improve the condition of the skin in these areas. 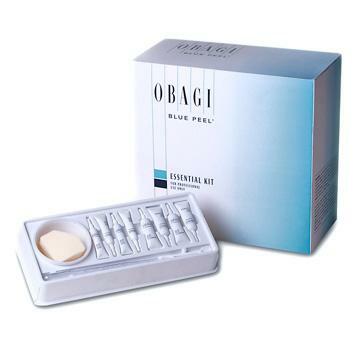 During the Obagi Blue Peel procedure, the patient can expect a mild burning sensation to occur that usually lasts for only a few minutes; the patient may then see a bluish tint to the skin (caused by the colour of the Obagi Blue Peel cream), which usually washes off completely within 12 to 24 hours. The number of Obagi Blue Peel treatments will be discussed by the physician or skin care professional with the patient, to achieve the desired skin improvement result. Depending on the strength and depth of the Obagi Blue Peel, the patient will experience a light degree of swelling right after the procedure. Within 2 to 3 days, the skin will start to peel; this peeling will continue over the next several days. By Days 7 to 10, full healing of the skin can be seen and experienced.